(a) FE-SEM image of ZnFe2O4 ferrite nanoparticle, (b) FE-SEM image, (c) TEM image, (d) HRTEM image of ZnFe2O4 ferrite nanopfiber. 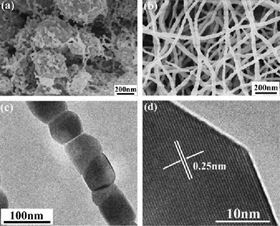 The ZnFe2O4 ferrite nanoparticle and nanofiber were synthesized by electrospinning method. The phase composition, morphology, magnetic and electromagnetic properties were analyzed. The results showed that both the samples exhibited a pure phase of spinel type ferrite. The ZnFe2O4 ferrite nanoparticle was aggregated, while the ZnFe2O4 ferrite nanofiber performed the homogeneous nano-fibrous shape as well as single-particle-chain structure. The magnetic analysis indicated that the ZnFe2O4 ferrite nanofiber showed ferromagnetic behaviour. Moreover, the dielectric loss and magnetic loss properties of ZnFe2O4 ferrite nanofiber were both enhanced due to its better dipole polarization, interfacial polarization and shape anisotropy. This paper was originally published in Materials Letters, 124 (2014), Pages 126-128. By photodoping silicon cylinders, researchers have built the first metal-free, dynamically tunable metamaterial for controlling electromagnetic waves.